There are just seven different species of sea turtles swimming the waters today. Sadly, the one thing they all have in common is that their numbers have plummeted over the past century. The situation is so serious that of those seven species, six are listed as endangered. Only the Loggerhead didn’t make it on that black list. A list that no species wants to find itself on. However the Loggerhead Turtles are not out of the woods (or the waters?) yet. They are still listed as threatened. 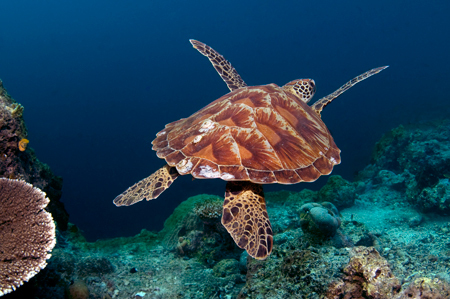 The waters around Kalimaya Dive Resort are home to primarily two species of marine turtles. We consider ourselves very lucky to have regular sightings of healthy Green and Hawksbill turtles. Swimming with one of these gentle creatures is something a diver never forgets. 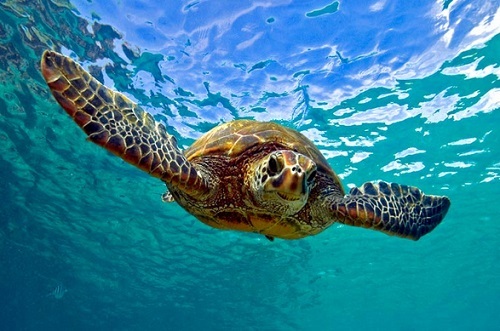 Sea turtles play an important part of the marine ecosystem. They help to keep the coral reefs and sea grass beds healthy. These are home to many other species including those that are of commercial value. Lobster and shrimp are two of the many species that are caught in these areas. Time is running out for the sea turtles if the situation remains unchanged. But it’s not too late if everyone pitches in to help. Green Turtles are one of the larger species of marine turtle. They can weigh up to 700 pounds, and have a carapace that measures up to five feet. Like other species of sea turtle they cannot pull their heads back under their shells. Unlike other species of turtle, the adults are herbivores, feeding mainly on sea grass and algae. Interestingly, young Green Turtles will also eat shrimps and small crabs. As they age they lose their appetite for these foods and become exclusively vegetarian. The Green Turtle does not actually have a green shell. Instead, they got their name from the greenish colour of their skin. You can usually tell a male from a female by the size of their tail. Males tails are longer, and they also tend to be larger than their sisters, mothers, and lovers. 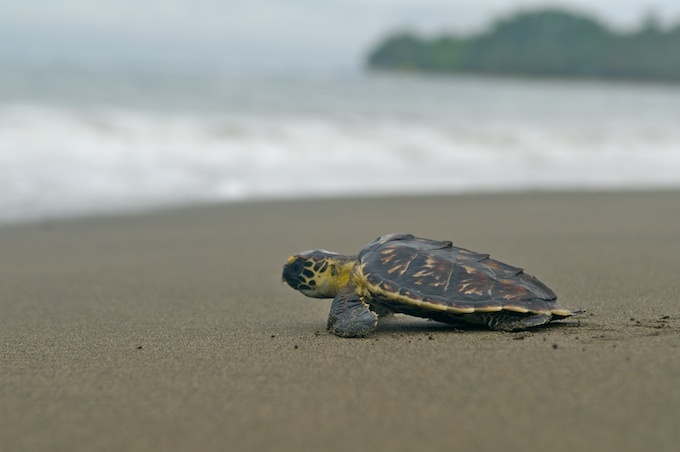 The Hawksbill Turtle is significantly smaller than their green cousins. Rarely weighing in at more than 150 pounds, their shells can reach a length of about 45 inches. Their name comes from the resemblance that their beaks have to that of a hawk. They also have “claws” at the end of their flippers. Males have longer claws, thicker tails, and brighter colouring than the female Hawksbills. Both are often found around reefs that are rich in sponges. These are the favoured food of Hawksbills, although they will happily chow down on jelly fish, spiny sea urchins, and a variety of crustaceans. Many Hawksbill Turtles have died eating plastic bags that have been carelessly discarded in the ocean. They mistake them for jellyfish, and the plastic gets caught in their digestive system, leading to a slow and painful death, often from starvation. Like other species of sea turtles, humans are responsible for their endangered status. Despite an international ban on collecting eggs and products made from the turtles’ shells, poachers continue to kill these gentle creatures. The turtles also become tangled in fishing lines and nets and drown. Loss of habitat is another serious concern for those who are trying to save the species. Coastal development means there are fewer quiet beaches where the turtles can nest. Coral reefs are shrinking and being negatively impacted by destructive fishing practices, reducing the availability of food for the turtles. You’ve heard it before, but we’ll say it again…”take only pictures (or memories) and leave only footprints (or bubbles! )” Support dive shops that show a respect for the waters where they operate, and the marine life the seas support. Get involved to raise awareness of the plight of sea turtles, and encourage others to spread the word. Don’t do nothing! Even a small donation to a conservation group, or a few hours of volunteer time can make a difference. Don’t ever, EVER, even think (for a nanosecond) about throwing your garbage (especially plastic) overboard. In fact, make it a habit to pick up trash when you see it on the beach or in the sea.